I don't typically review software on my blog because as a family we don't buy very many games for the computer. My daughter doesn't often get the chance to play on the computer. However, last year I did purchase a Dora Candyland game for her to play every once while I was nursing her brother. While many games are available for free online, I do worry about unsupervised play because with just a click of the mouse, children can visit undesirable websites. Playing a game that is downloaded to the computer helps eliminate this possibility. Just recently as an Amazon.com customer I was given the opportunity to review a new Dora game called Nickelodeon Dora the Explorer: Lost and Found Adventure . The game is geared toward children ages 2-5. Dora and her friends plan to hold a music show and picnic celebration, but sneaky Swiper swipes all their instruments and picnic supplies. 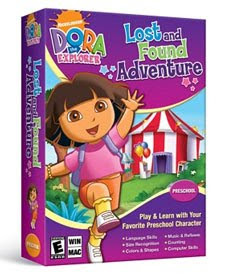 Dora asks for help in locating all the hidden things and implores the game player to assist in the retrieval. Through playing interactive games, children help Dora on the adventure, visit locations such as the beach, garden and circus and are rewarded with the chance to listen to a musical concert in the end. Children can save the game in case they will not have time to completely finish all the tasks in one sitting. In order to play they do not need to be able to read because Dora verbally explains all the directions. The game helps preschool-aged children develop their computer skills and learn how to use a mouse and follow directions. The game also teaches very basic preschool skills such as problem solving, matching, counting, and colors. It does not teach letters or words. While it isn't exactly the most educational game that we've played, it is very entertaining. Most preschoolers I know are drawn to Dora, and the game features brightly colored scenes and vibrant graphics. My 4yo daughter easily completed all the tasks, navigated through the different options and didn't need much assistance at all. Very young children would be able to play the game without getting frustrated so long as an adult is able to assist them. My daughter's favorite parts of the game are helping Dora and Tico catch nuts, and she also really likes helping the baby circus animals find their mommies. She happily collected stars to unlock the printable coloring sheets. She loves to color and really liked the matching game coloring sheets!